Mr. MCNERNEY (for himself, Mr. GEORGE MILLER of California, Ms.LEE of California, Mr. HIMES, Mr. TOWNS, Mr. GRIJALVA, Mr. GARAMENDI, Mr. Honoring and recognizing David ‘‘Dave’’ Warren Brubeck for his contributions in musical composition, jazz, and to the international community. 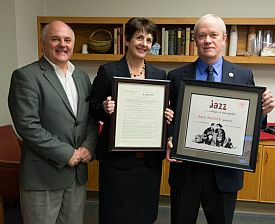 Resolved, That the House of Representatives honors and recognizes David ‘‘Dave’’ Warren Brubeck for his legacy in music composition and jazz, and his contributions to the internatioal community.